Comedian Khalid Rahmaan, 36, produces a bi-monthly comedy show in Crown Heights, where he lives and grew up. He occasionally works in material about the neighborhood into his sets. CROWN HEIGHTS — Like Starbucks, local produce and steadily rising rents, a new comedy act has found a home in Crown Heights — and some of the jokes are about the neighborhood. 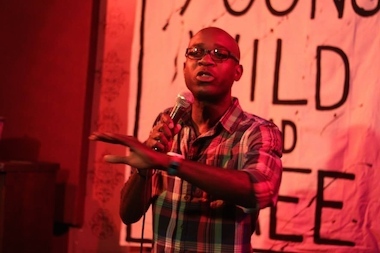 The “It’s Sooo Up-and-Coming” comedy show, named for some Crown Heights newcomers' description of the area, takes over the 739 Franklin Bar & Lounge every other Thursday, said Khalid Rahmaan, 36, the comedian behind the bi-monthly event. Rahmaan, who lives off Franklin Avenue and grew up in the neighborhood, has seen the change firsthand. Rahmaan has taken the stage for about two years, forcing himself to perform at open mic nights almost every night of the week for practice. He often includes jokes about gentrification in his sets, even ribbing on his own contribution to the problem. Rahmaan himself attended Boston University and then returned home. In another part of his Gotham Comedy Club act he pokes fun at stylized store names in so-called up-and-coming areas. Despite the name of the show, the performance at 739 Franklin Ave. won’t be exclusively about the neighborhood. Rahmaan will host a diverse group of comedians who cover a range of topics, he said. This Thursday’s show, as with all the ‘Up-And-Coming’ shows since December, will feature about seven comedians over an hour-and-a-half, with music by DJ Mike Styles in between sets. This week’s headliner is Hadiyah Robinson, a stand-up comedian regularly featured on BET. Rahmaan himself performs, as well, doing a 10-minute set in addition to producing and promoting the show. The “It’s Sooo Up-and-Coming” Comedy Show takes place every other Thursday night at 739 Franklin Ave. at 9 p.m. The next show is set for Thursday, July 24. The show is free, but there is a one-drink minimum to support the bar, Rahmaan said.